2019 Sticky Fest Going on Now! Hey Wingers Fans, we have an important cause we would like to share with you! We are promoting JDRF’s One Walk and helping them reach their fundraising goal of $359,500! JDRF’s goal is to help create a world without Type 1 Diabetes. They’re two-thirds of the way there, and we need your help closing the gap! As part of our annual JDRF Fundraiser, we will be offering coupons of $10 in value for a suggested donation of $3 to JDRF. You can get your coupons at any Wingers location! Additionally, if you are in the Salt Lake City area and would like to get involved, JDRF is hosting their One Walk to promote awareness this Saturday, September 22nd at Liberty Park at 9 am. Wingers will be there giving away Amazing Sauce and coupons! If you’re not in Salt Lake, but would still like to support, check the link below to see if there is a One Walk near you tomorrow. Here’s our team at last year’s event. We hope to see you this year! 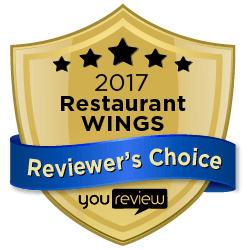 Combining extraordinary handmade food, drink, craft beer, and great service in a fun and energetic atmosphere, WINGERS is dedicated to keeping your taste buds tingling. Find a WINGERS Near You!